Mayor Kevin Faulconer's proposed rules of the road for dockless bikes and scooters go before the City Council later this month, but their pending approval isn’t stopping the city from making changes. The city is creating what it calls parking corrals: designated zones stenciled on the roadway for riders to park their scooters and bikes. They are small spaces carved out of red zones where cars are prohibited from parking. The city just started stenciling them in Cortez Hill and other downtown neighborhoods. The corrals are 150 square feet. The intent, of course, is to get them off the sidewalks and out of other pedestrian spaces where they are often left. Some say there are too many reckless riders, too many riders moving in car and pedestrian traffic, and too many parked in the way of too many. "Sometimes they are everywhere. They are on your sidewalk or right in front of your door,” Cortez Hill resident Sabrina Kaiser said. The parking corral is the city's answer to the clutter. So far, reviews are mixed. 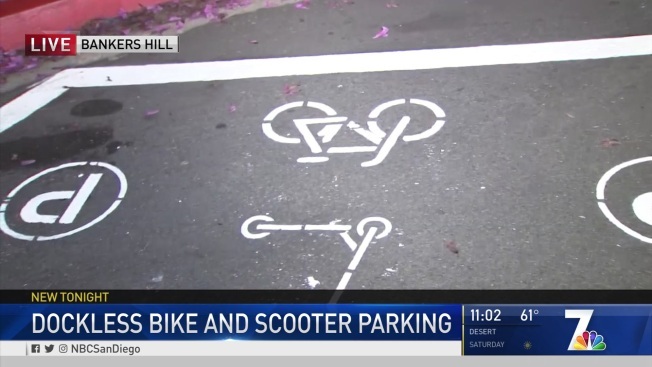 "It's not taking up parking spaces and it keeps the scooters and the bikes all in one area, " Sabrina Kaiser said. The city tells NBC 7 parking corrals are for dockless vehicle companies to use for staging instead of the sidewalk. "I don't see a problem with at least making the attempt to make it better," Cortez Hill resident Brennan Quigley said. Eventually though, the expectation is that riders will use them for drop off as well. “When people use them I think they'll just leave them where ever they want. You are relying on people having good manners,” Quigley said. The corrals come without consequences for bad etiquette, but there are penalties for riding in prohibited areas. "It can be affective because a lot of times you have to drive on the sidewalk to park and you're not supposed to drive on the sidewalks," Eric Grecco said. Grecco loves the ease of dockless transportation and uses it all the time. He did, however, fail the first test of the corrals’ effectiveness, which is noticing them in the first place. "I didn't notice that spot . You saw me pull up and come right here, so who knows," Grecco said. The city is planning to make approximately 330 of the designated spaces across the city. The cost comes out of the current budget. If you are looking for a map of these zones they are still working on that. Besides the parking zones, the Mayor's proposed regulations call for reduced speeds in certain areas and parking and staging rules, as well as fees and permitting for scooter and bicycle companies.